The Inner Clarity: Blue Ocean Cocktail: 1 Oz. Vodka 1/2 Oz. Blue Curacao 1/3 Oz. Grapefruit Juice 1-2 Splashes Simple Syrup Add All Ingredients To A Shaker Filled With Ice; Shake, Then Strain And Serve Either Straight Up In A Martini Glass Or Over Ice. Garnish With An Orange Slice & Tropical Flower. 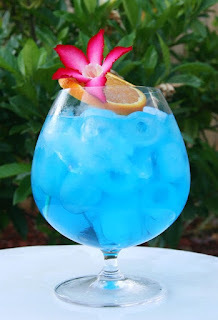 Blue Ocean Cocktail: 1 Oz. Vodka 1/2 Oz. Blue Curacao 1/3 Oz. Grapefruit Juice 1-2 Splashes Simple Syrup Add All Ingredients To A Shaker Filled With Ice; Shake, Then Strain And Serve Either Straight Up In A Martini Glass Or Over Ice. Garnish With An Orange Slice & Tropical Flower.